The HTC Freestyle is the first phone to hit U.S. shores running Qualcomm's BREW MP operating system. Thanks to HTC's tinkering, however, the Freestyle behaves more like a Sense-equipped smartphone...most of the time. HTC has put its user interface and software development chops to good use on this little phone, which emulates the Sense smartphone experience on a device that's not a smartphone. 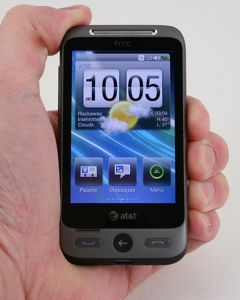 The HTC Freestyle is one of the first to be based on Qualcomm's BREW MP. HTC proves that even non-smartphone operating systems can be simple and powerful. The V8 Pro is ZTE's latest attempt to bring U.S. consumers more bang for their buck. The U11 is HTC's flagship smartphone for 2017. It competes directly with the iPhone 7 Plus, G6, and Galaxy S8+. Sony today announced the Xperia L1, an Android smartphone that will reach American shores as soon as next month. The phone features a 5.5-inch 720p HD display and is powered by a 1.4 GHz quad-core MediaTek processor with 2 GB of RAM and 16 GB of storage. Support for Google's Android Auto expanded this week thanks to new efforts taken by Volvo and Kenwood. Volvo plans to adopt Android Auto within its infotainment center. Why would anyone buy this phone? I am an owner of an HTC Inspire 4G. I pay $15.00 a month for data. If I had bought the HTC Freestyle, I'd still pay $15.00 a month for data. I realize it doesn't require a data plan, but realistically, you'll want to have one. Otherwise, you might as well get a simple flip phone and be done with it. As for the phone price, I bought my Inspire at the no commitment price, so the Freestyle would be $100.00 less. The huge decrease in functionality, in my opinion, wouldn't be worth saving $100.00. Nice feature phone (HTC's Sense UI rocks), but ultimately not worth it. what a GENIUS first post. you must be sooo proud. the reason why Opera Mini doesn't work is simple: this phone is based on Brew, which is like the enemy of Java. Opera Mini is written in Java and requires a good JVM (except for a couple of native ports).